Dental practice with over 30 years of providing smiles to all generations! 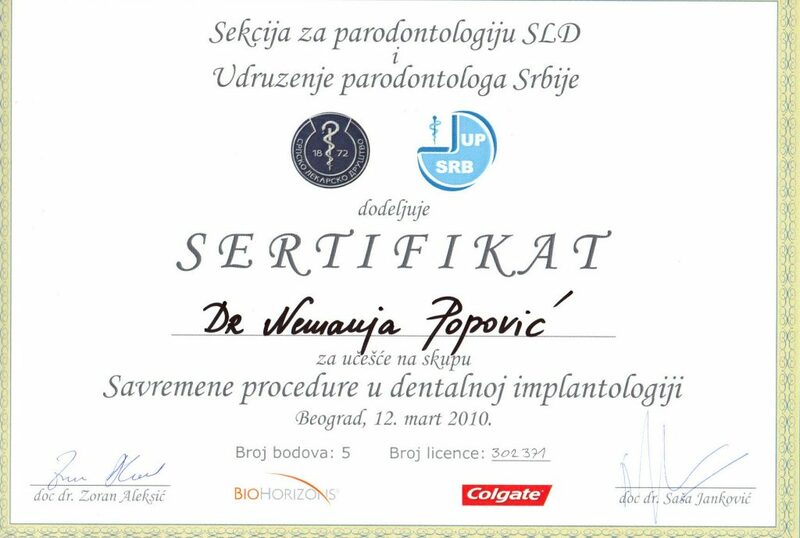 Welcome to Dr Popovic Dental Clinic, a dental practice with over 30 years of providing smiles to all generations! 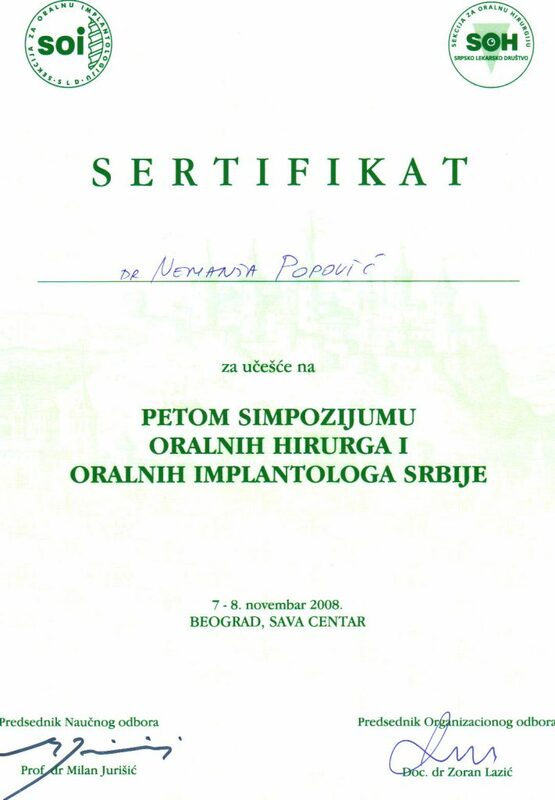 As one of the first private dental practices in Serbia, we offer a wide array of dental services, with main focus on oral surgery and implantology, regeneration procedures of soft and hard tissues, parodontology and prosthodontics. Our practice is equipped with up-to-date advanced technology, such as the soft tissue laser, CAD/CAM set up, apex locator, digital intraoral camera and many other. This is just one of the advantages that sets us apart from the competition. 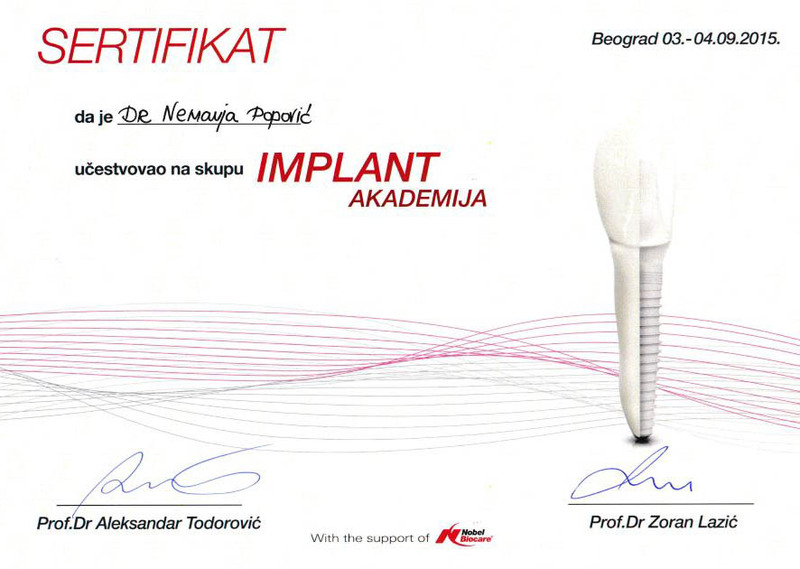 In our three decades of providing top quality dental services, we have succesfully served thousands of satisfied clients, not only from Serbia but from all over the world. 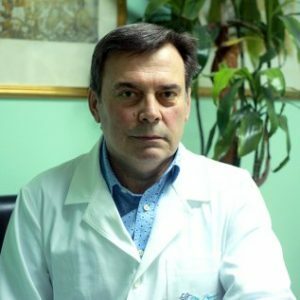 Dr Dragoslav Popovic, founder of our practice with over 35 years of experience, wanted to build a family oriented clinic for patients of all ages which he has succesfuly accomplished. 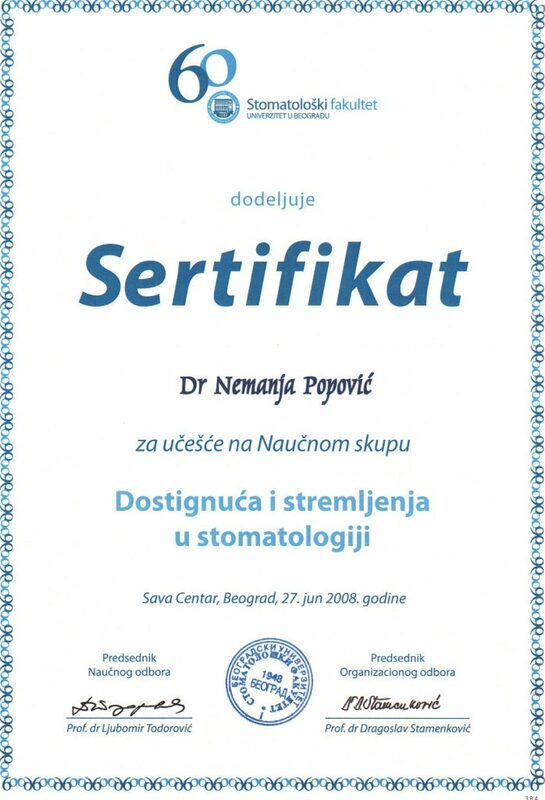 His vision was shared and perfected by his son, Magistar of Science and a Specalist in Oral Surgery and Implantology, Dr Nemanja Popovic who is succesfuly running the Clinic for the past 10 years. 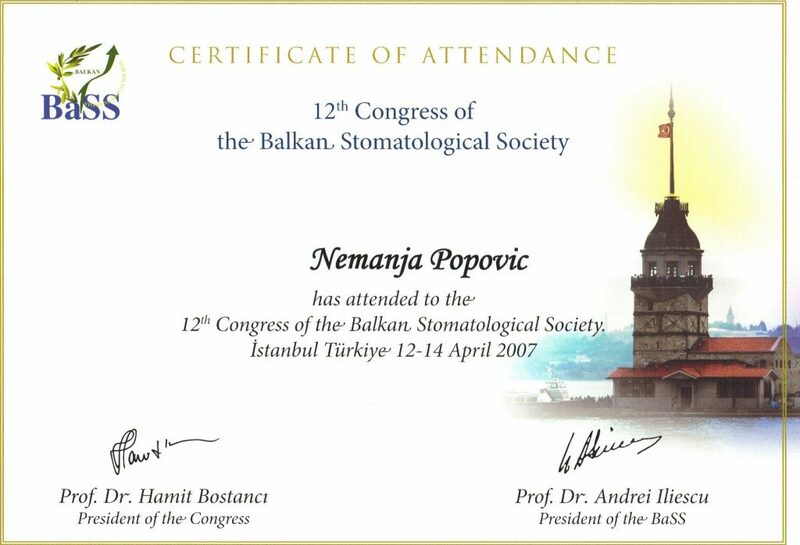 At the same time, Dr Nemanja is perfecting his expertise by continuous education in the country and abroad. 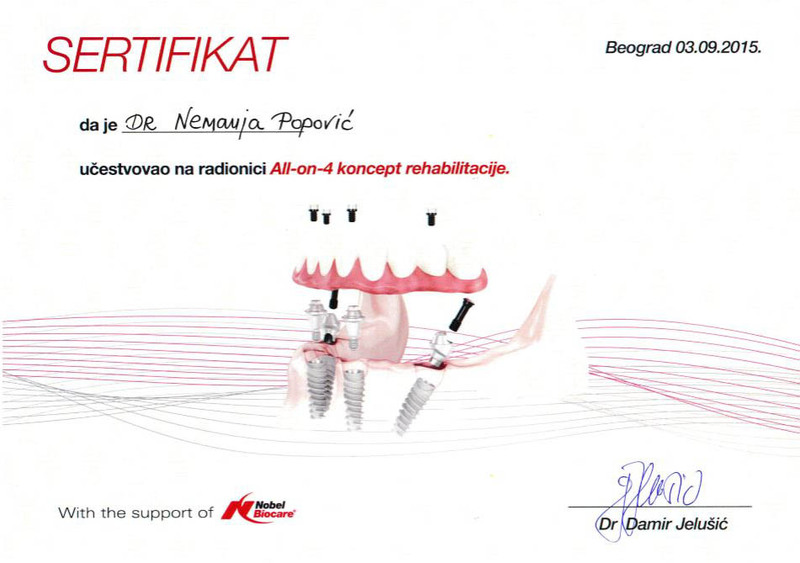 Next to our clients from Serbia, more and more clients from all of the world are using our dental services. 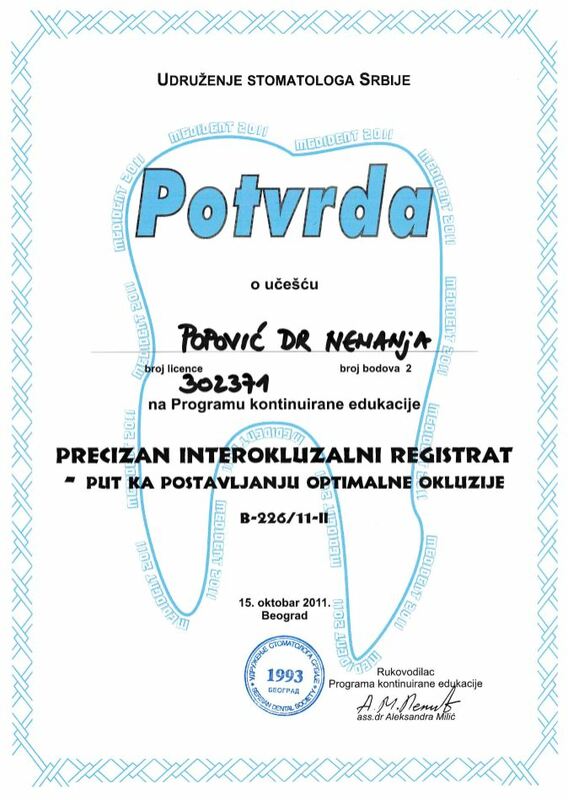 The increase of their numbers is easily explained with Belgrade being a popular tourist destination and when you combine that with top quality dental services that we provide at lowest prices available, you get a winning combination! 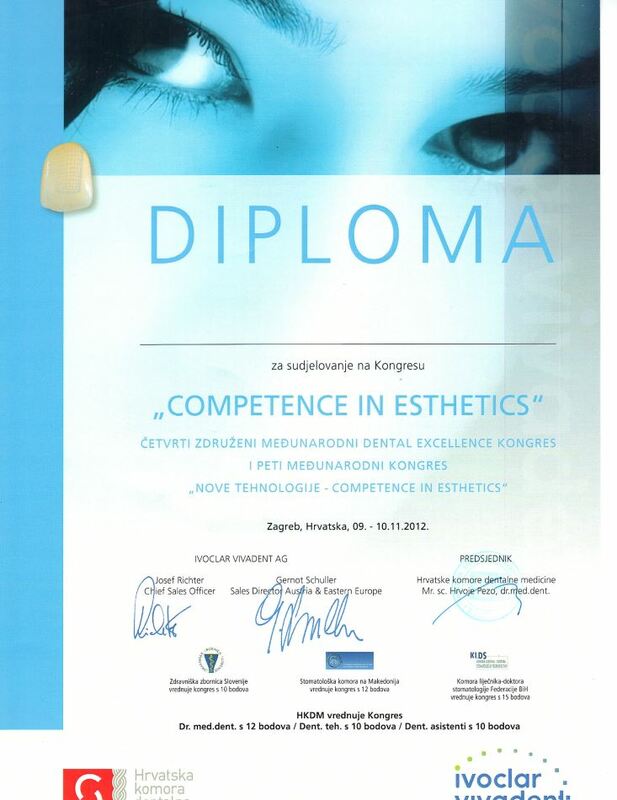 Many satisfied clients can agree with this since many of them are comming to Belgrade even after the treatment. 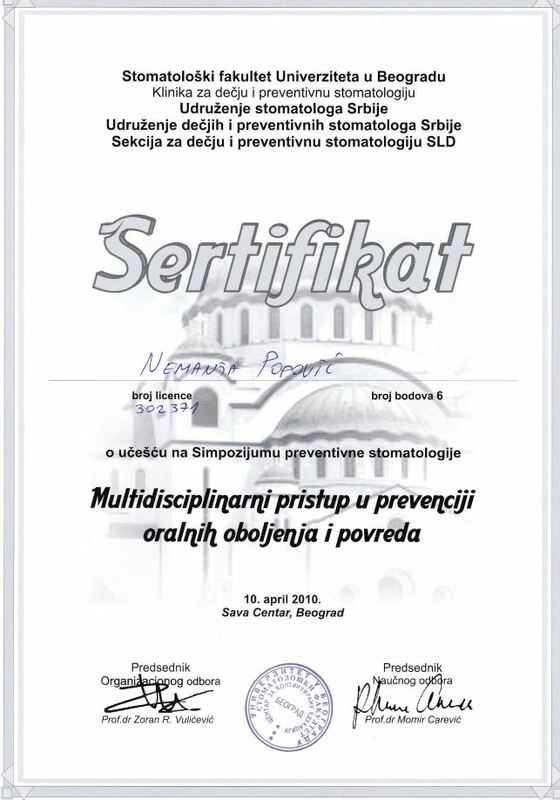 We are proud to state that our Clinic and staff are one of the only in this field that can offer a complete package of services to our clients, not only dental services but also all the services that one might need in all aspects of dental tourism susch as: arrival organization, accomodation, activities in Belgrade and the region, translator services when required, etc. 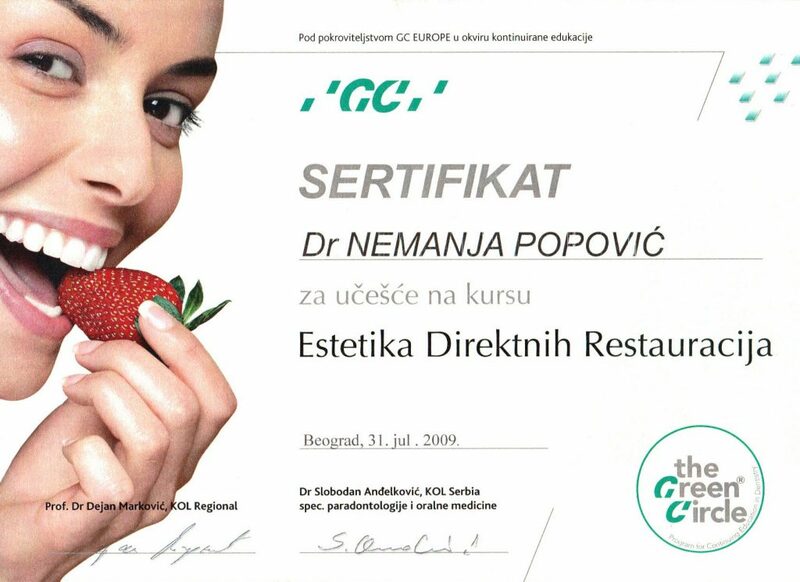 We invite everyone to enjoy all the qualities of our services and become a part of our family tradition! 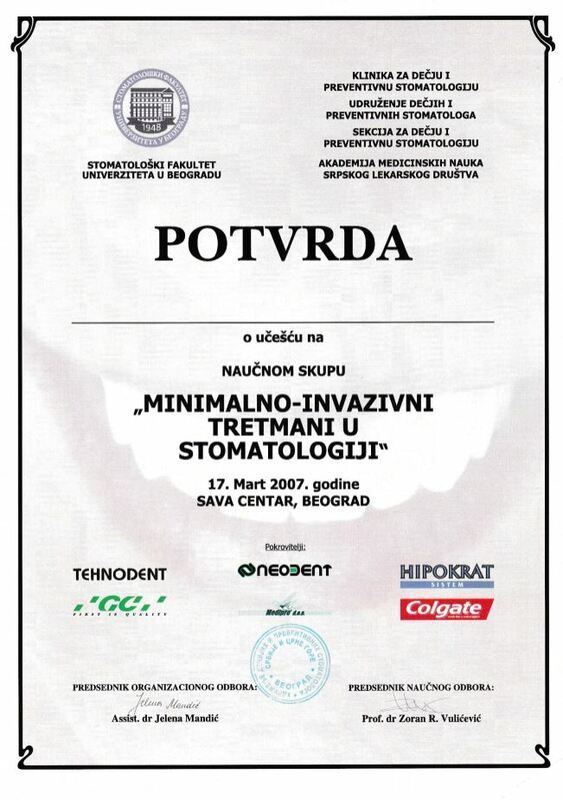 Dental services abroad are many times more expensive than in Serbia. Accordingly, dental tourism has become very popular in our country, due to low prices and high quality of services. The prices of dental services in our practice may be up to 80% lower than in other countries. 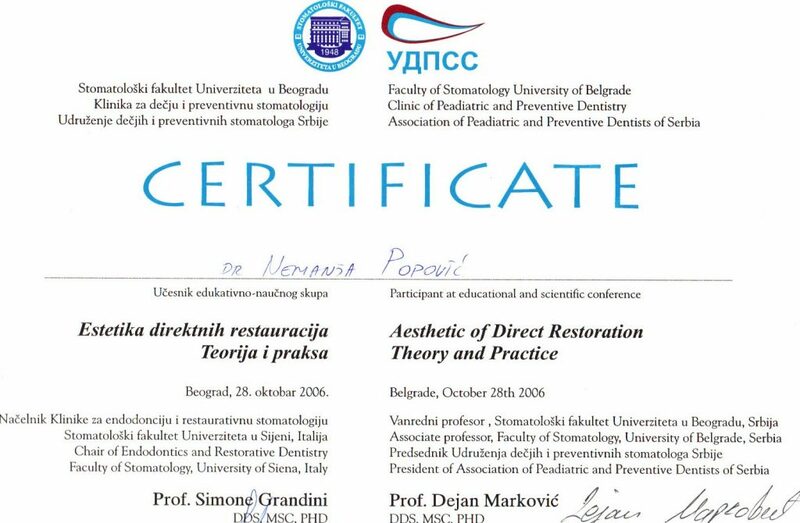 Dental practice “Dr Popovic” organizes your entire stay in Belgrade during your visit for obtaining dental services. 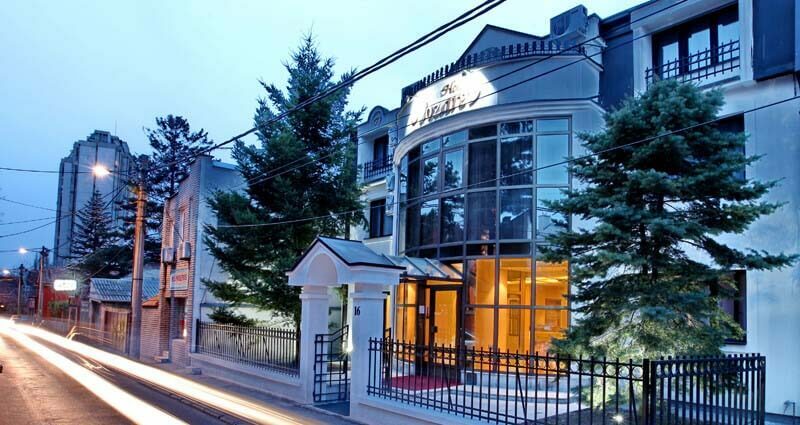 In cooperation with partner organizations: tourist, hotel, and taxi services, we will do everything to make your stay in Belgrade a pleasurable one. 1. First you should fill out the contact form via button "CONTACT CLINIC" describing the situation you wish to resolve and submit it along with a digital ortopan which is not older than 6 months. 2. 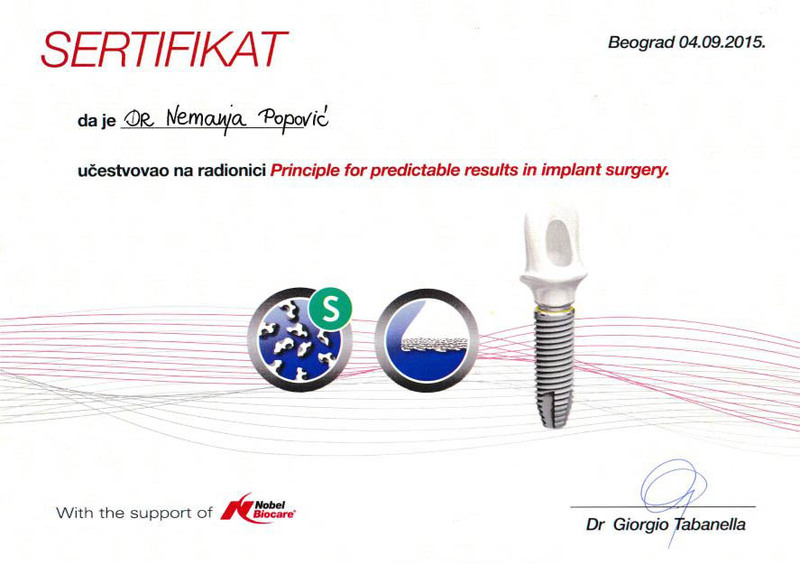 After receipt of your inquiry the staff of “Dr Popovic” will contact you with the suggested preliminary plan for resolving your situation and the prices of the services. 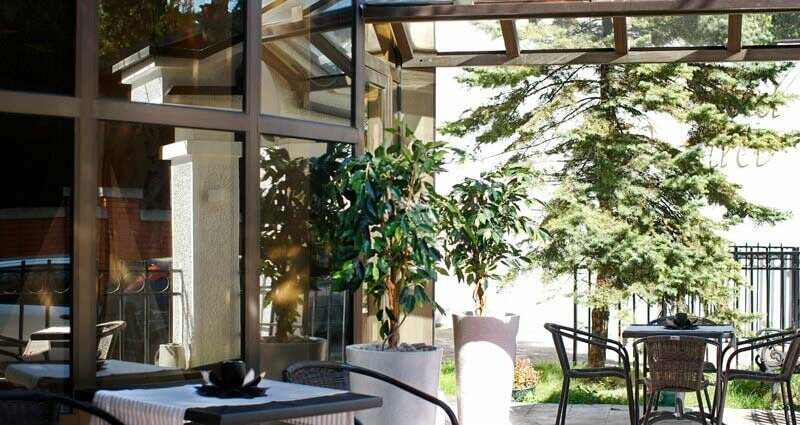 - We organize your stay in Belgrade in apartments and/or hotels with 3* or 4* at affordable prices or you will have free accommodation if you need greater reconstructive work. 4. During your entire stay at the dental practice you will have a translator at your disposal. We offer to all our patients the highest quality standards, individual access and a high level of organization. Please do contact us for an obligation-free consultation in order to find out more about our services. Our staff will give you all the information you may require. 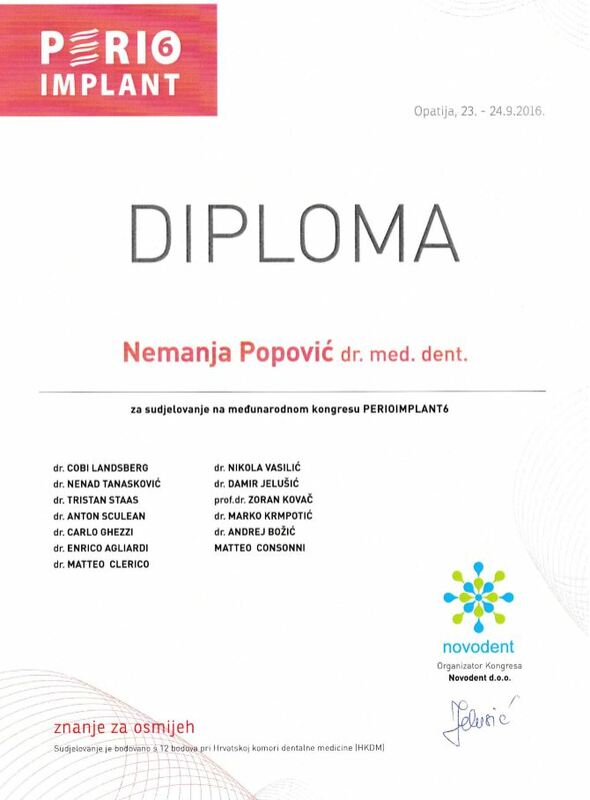 Dental practice "Dr Popovic" is known for continuing education of its employees, as well as using the latest technology in dental practice. CAD/CAM complements earlier technologies used for these purposes by any combination of increasing the speed of design and creation; increasing the convenience or simplicity of the design, creation, and insertion processes; and making possible restorations and appliances that otherwise would have been infeasible. Other goals include reducing unit cost and making affordable restorations and appliances that otherwise would have been prohibitively expensive. 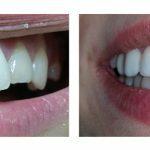 However, to date, chairside CAD/CAM often involves extra time on the part of the dentist, and the fee is often at least two times higher than for conventional restorative treatments using lab services. CAD/CAM is one of the highly competent dental lab technologies. An intraoral camera is a tool a dentist uses to examine patient’s mouth in as detailed a way as possible. An electronic apex locator is an electronic device used in endodontics determine the position of the apical constriction and thus determine the length of the root canal space. The apex of the root has a specific resistance to electrical current, and this is measured using a pair of electrodes typically hooked into the lip and attached to an endodontic file. The electronic principle is relatively simple and is based on electrical resistance – when a circuit is complete (tissue is contacted by the tip of the file), resistance decreases markedly and current suddenly begins to flow. This event is signaled by the device. Laser technology is one of the most modern and most innovative therapy modalities of today. 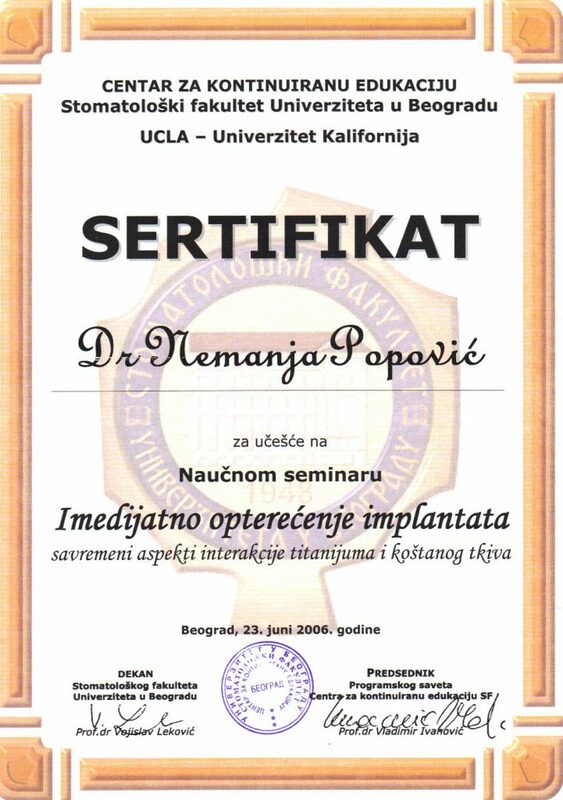 The laser beam is a high intensity focused light of a certain frequency that allows for tissue manipulation with fast regeneration, and it has been successfully used for decades in many fields like ophthalmology, urology and dermatology. 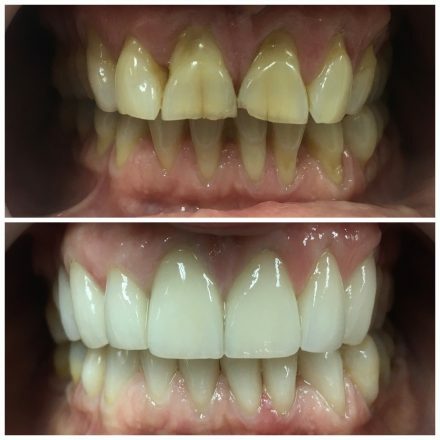 Today, more and more dental doctors are using the benefits provided by laser therapy in every day practice, and the patients have shown greater affection towards this model of therapy compared to the conventional methods. Reasons for that are obvious – laser treatment is quicker, more efficient and less painful than the standard procedures. As a minimally invasive method, laser can be used instead of the scalpel. 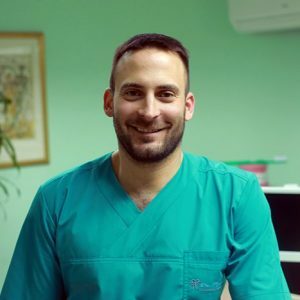 This is why Dental Clinic Dr Popovic offers to its patients services with a diode laser from German manufacturer Elexxion, which guarantees high quality and long lasting results. Elexxion Claros Pico combines state of the art technology with high quality and a wide spectrum of treatment possibilities that dental professionals require in every day practice. This diode laser is designed for treating root canals, periodontal indications as well as different soft tissue procedures. Also, laser-assisted teeth bleaching is considered to be most effective with longest lasting results. 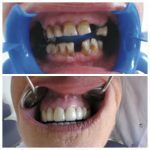 Fistula therapy, abscess treatment, periodontal pocket debridement, and gum disease therapy are but a few notable mentions. Laser therapy is suitable for all ages; therefore children as well as adults can be treated. 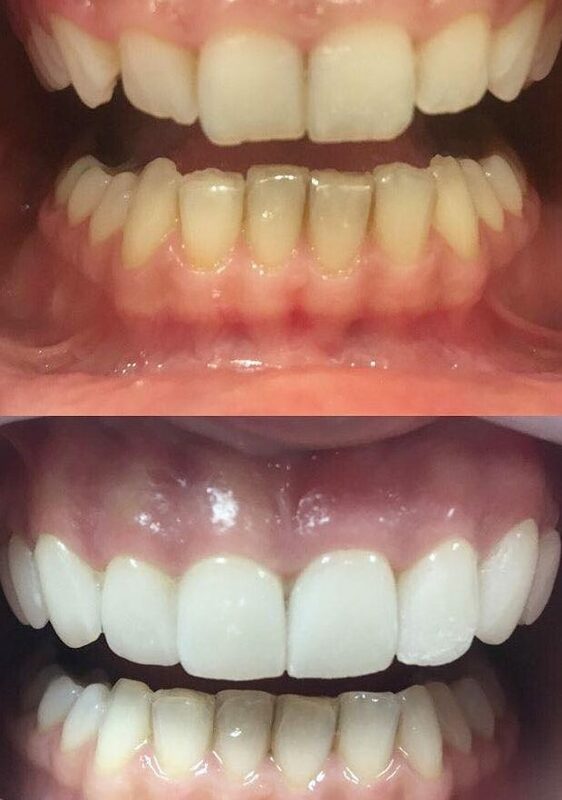 This treatment is largely convenient and reduces the stress from oral interventions, at the same time facilitating the procedure and the recovery process, which makes it one of the key therapy methods in our arsenal providing exquisite care to our patients, a feature which we have always been especially proud of. 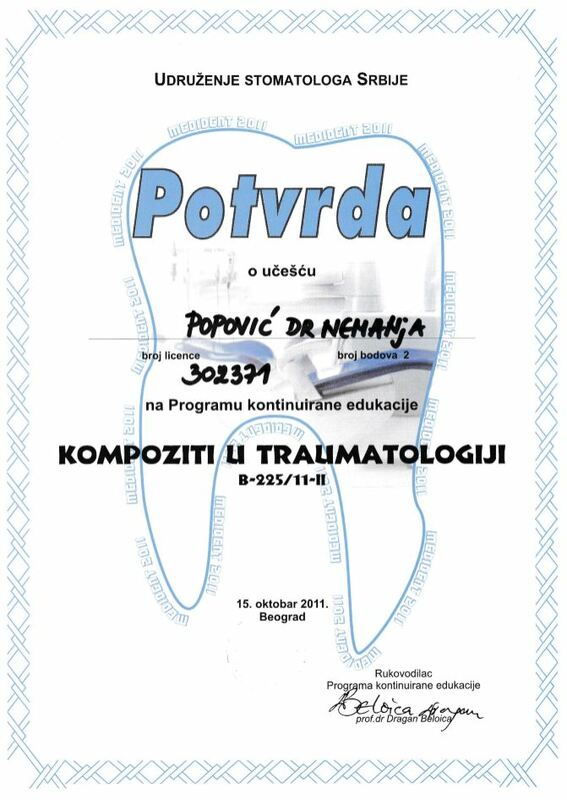 View the medical prices of Dental Clinic Dr POPOVIC, in Belgrade, Serbia. 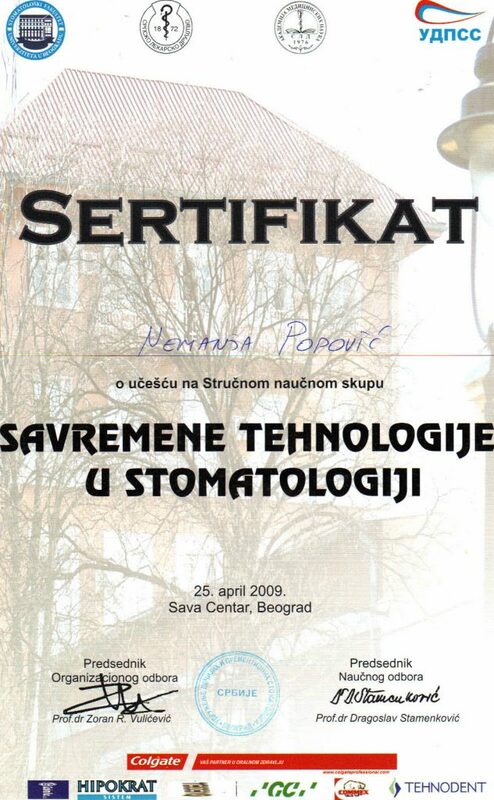 Definitivno najbolja stomatološka ordinacija u gradu. Svaka preporuka ! Perfection in any way.... thank you !!!
. I had an perfect experience. Professional, caring, collegial, and expertly done. Very nice, friendly, and professional. Clean facility. Caring and Gentle. Very good value for the services I had! Dentist is Great. Well spoken. Thank You, great dentist !! I'm quite satisfied with the service. 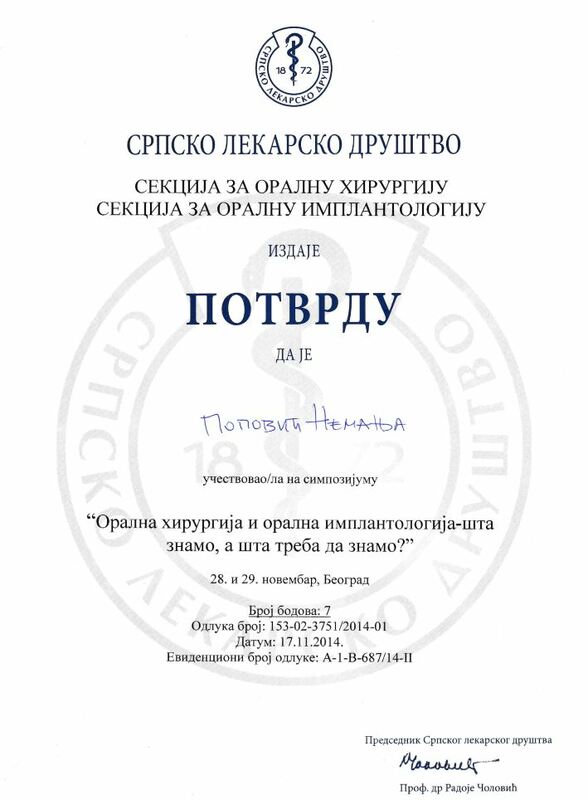 Dr Nemanja is the best. 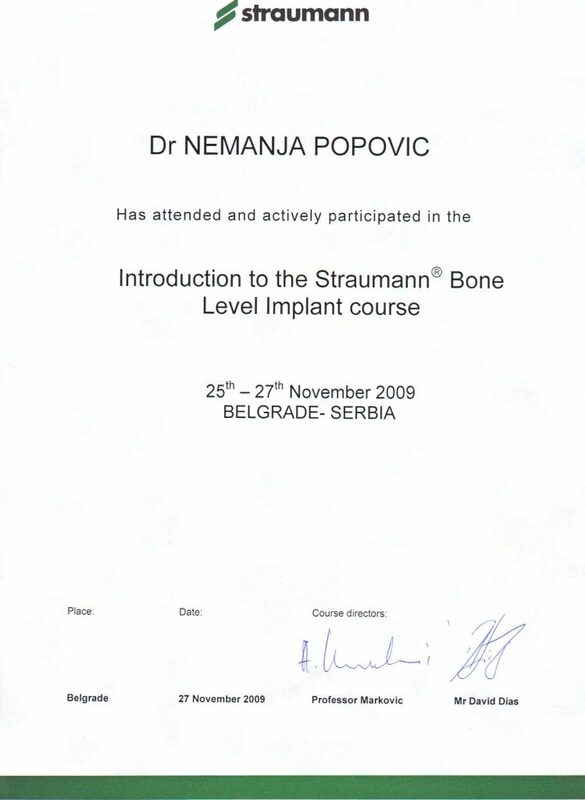 Dr Nemanja is very professional. 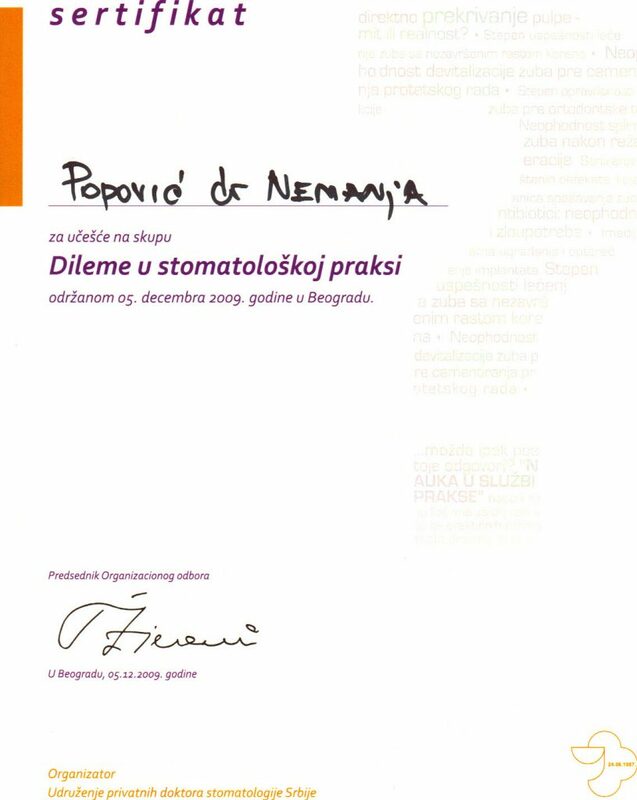 Dr Nemanja is very helpful. Very clean and nice dentist's office. I'm very happy with this clinic. Great job and very very honest!!! 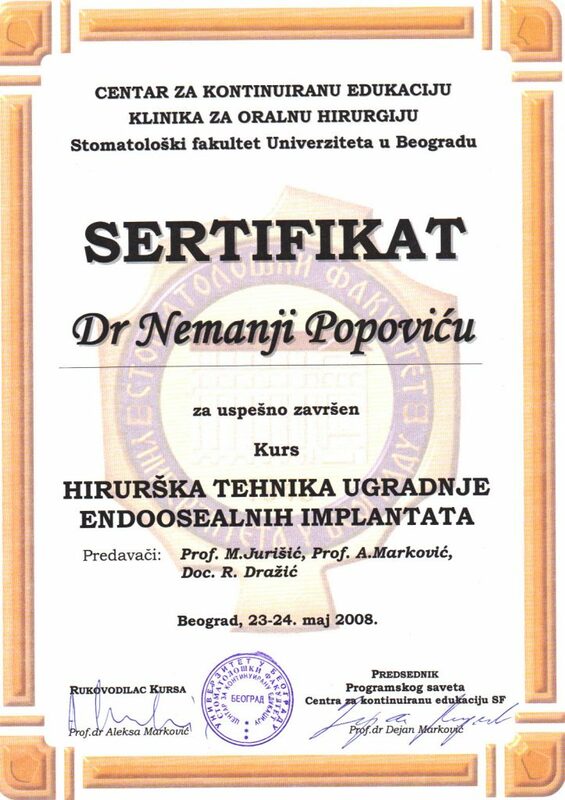 He graduated at Faculty of Dentistry (Dental School), University of Belgrade in 1978. 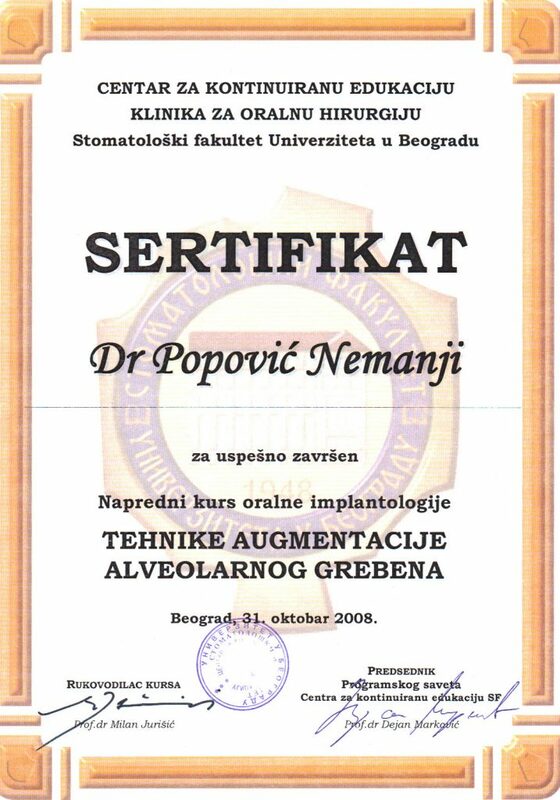 He founded ‘’Dr Popovic’’ dental practice in 1987. 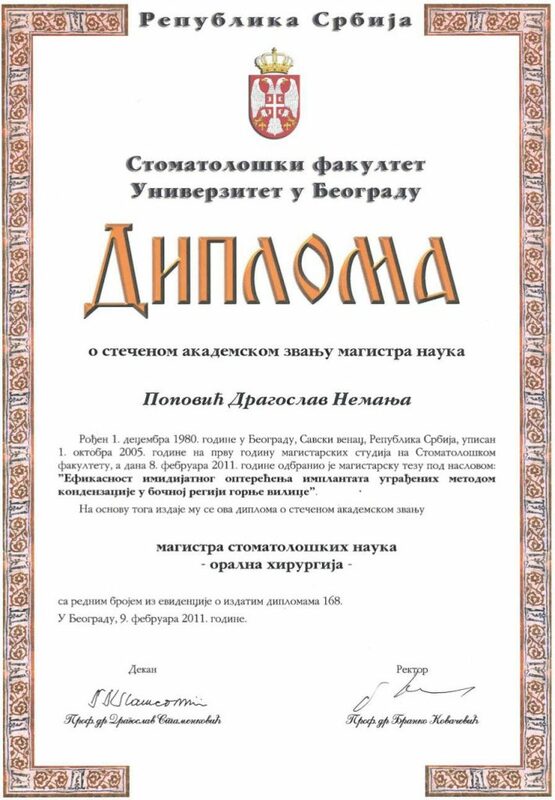 Before the practice, he worked as a dentist at community health center Zvezdara. Mr. sci. 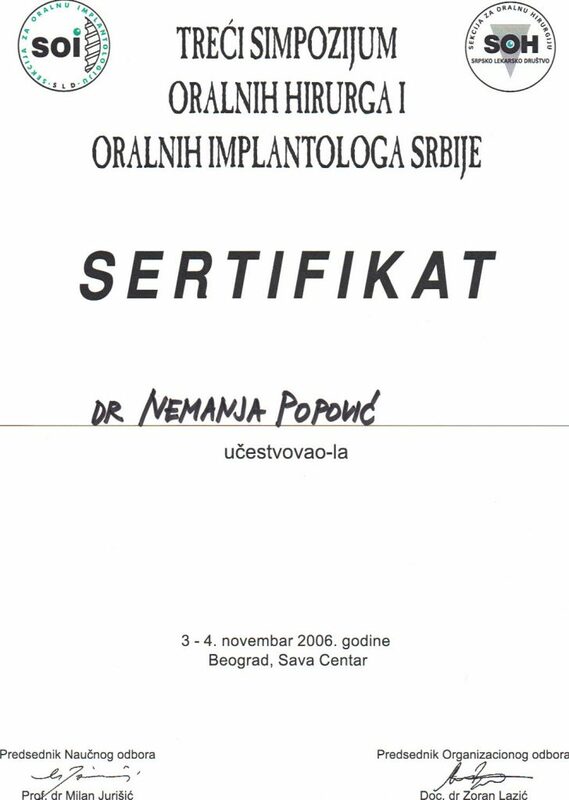 dr Nemanja Popovic graduated at Faculty of Dentistry ( Dental School), University of Belgrade in 2005 and obtained a Master’s degree in oral surgery and implantology in 2011 with the topic “Possibilities of immediate loading of Straumann implants implanted by bone condensation technique in the posterior maxilla”. 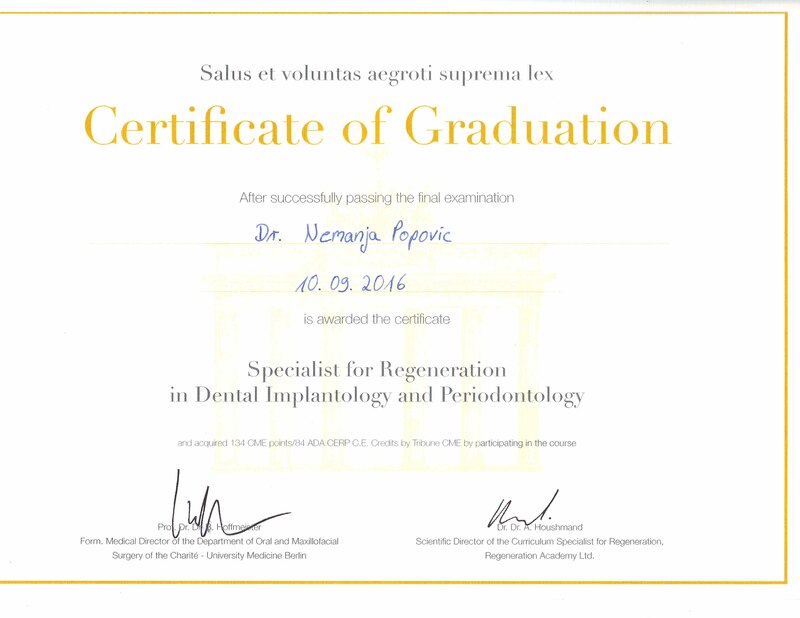 In 2013 he obtained a Specialist Oral Sergion degree at the same University. He is currently a dental sciences PhD candidate. 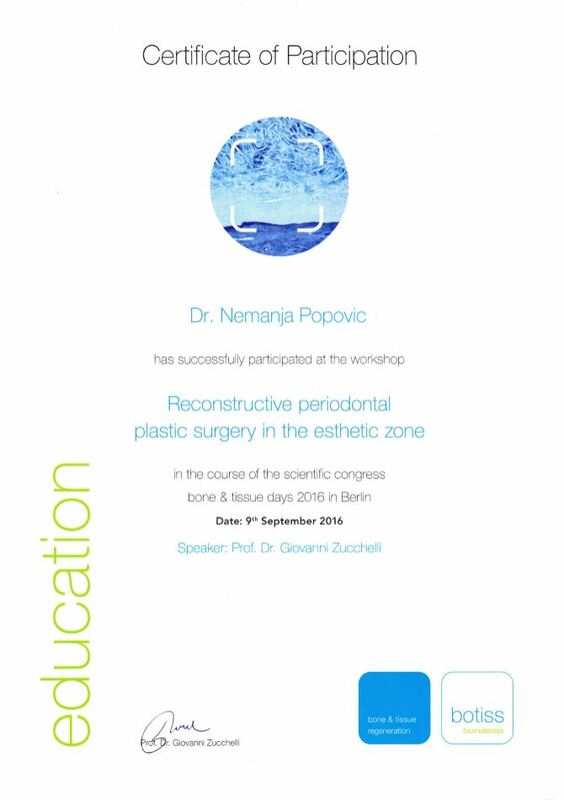 In 2016 he became Specialist for Regeneration in Dental Implantology and Periodontology, by University Charité, Berlin. 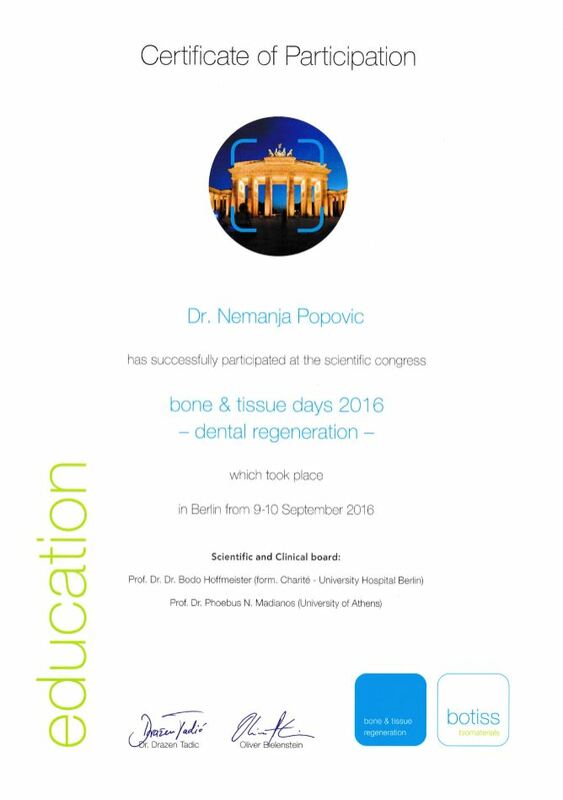 He continuously participates in various seminars and congresses related to various areas of dental services, materials, and innovations in order to provide the highest possible quality of service to his patients. 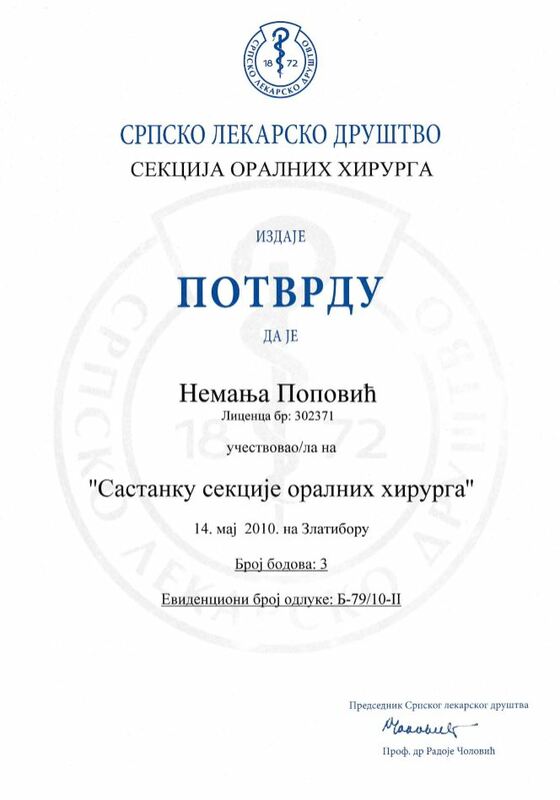 Olivera Popovic graduated from Faculty of Mathematics, University of Belgrade and carries the title Engineer of applied mathematics. 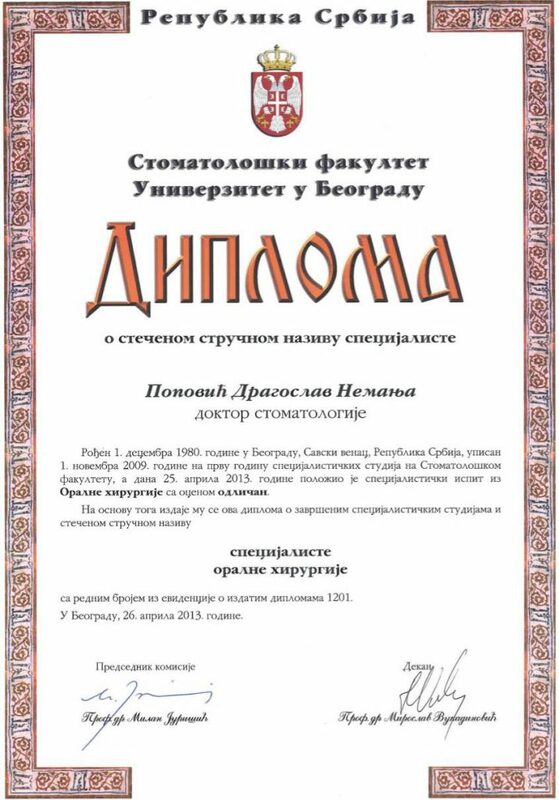 She spent 30 years working in IT sector as a programmer, and a system engineer and an executive manager at the education center ‘’Informatika’’. Appart from that, she spent 15 years at a private company “PSTech” DOO as a founder, CEO and deputy CEO. 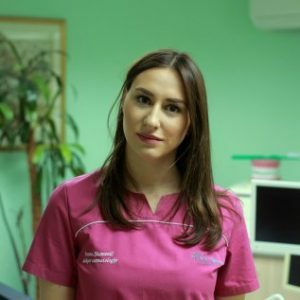 Olivera is currently an executive director at ‘’Dr Popovic’’ dental practice, where she is in charge of organizing and business management, marketing strategy, technical and commercial support for clients, communication with partners and clients as well as continued staff educations. 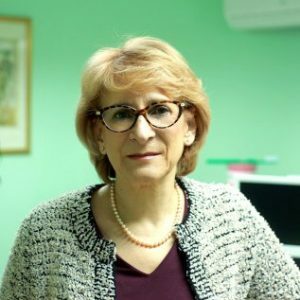 Olivera is also an active member of Association of Business Women in Serbia from 1999, and from 2006 to this day she is a vice president and a board member there. 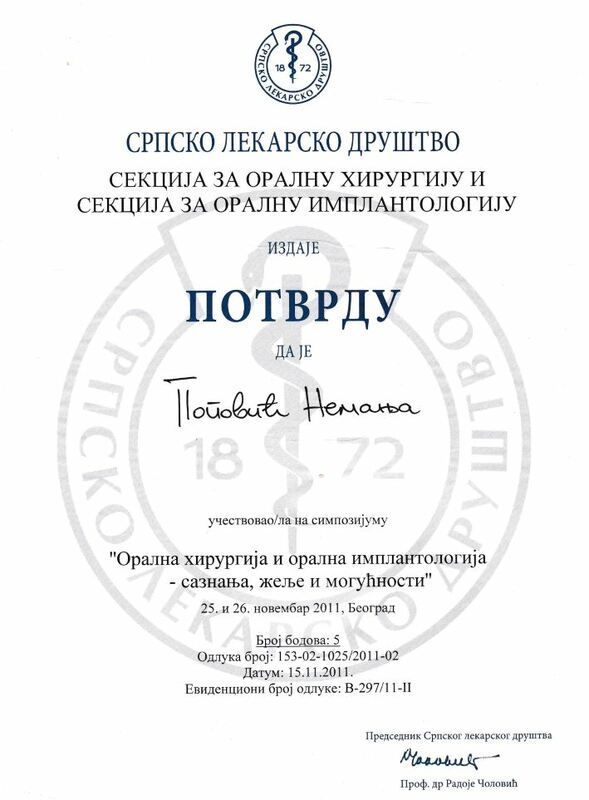 Dr Ljiljana Milosević graduated from the Faculty of Dentistry, University of Belgrade with average score 9.2. 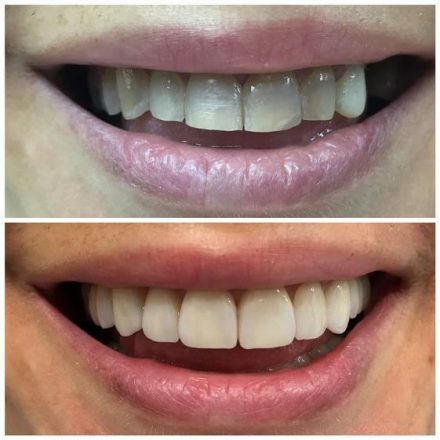 She spent two years training at the Military Medical Academy, department of prosthodontics. 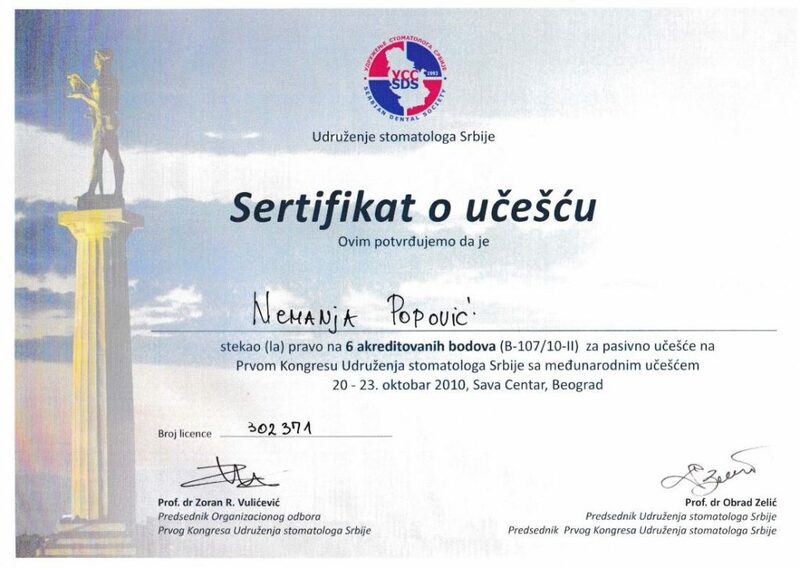 She works in practice „Dr Popovic“ since 1991. 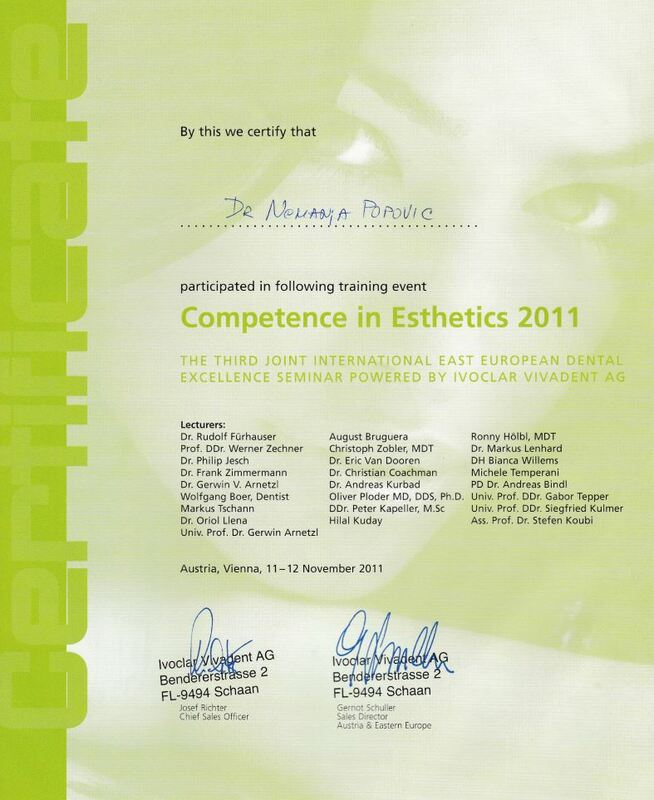 She graduated at Faculty of Dentistry (Dental School), University of Belgrade in 2008. 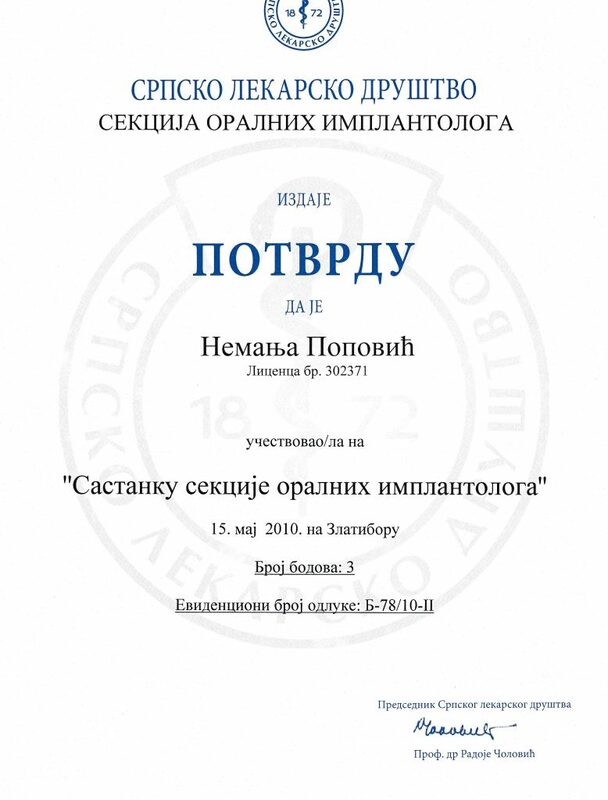 As one of the top students, she was a scholar of the Government of the Republic of Serbia, the Ministry of Education and the Ministry of Science and Technological Development. 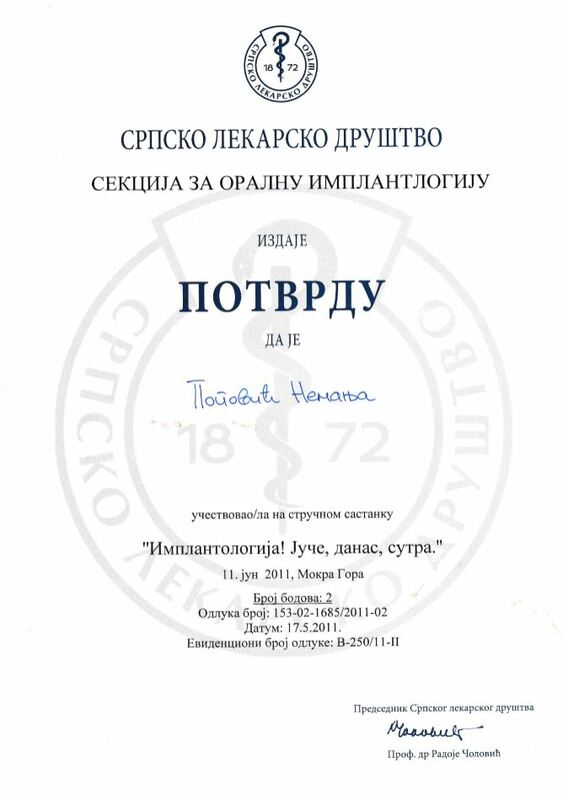 She works as an assistant at a Dental disease and endodontics clinic, at University of Belgrade. 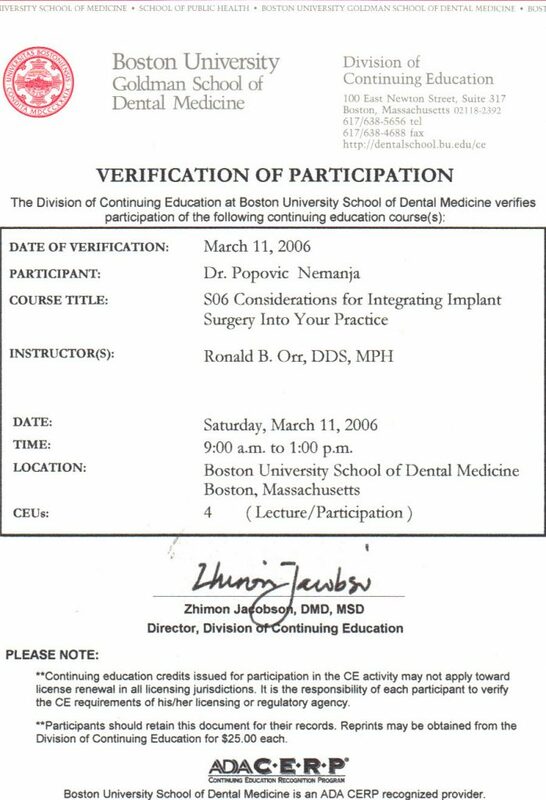 In 2008 he enrolled in doctoral studies, reported a 2012 doctoral thesis in the field of dental disease and defended her doctoral thesis in 2016. 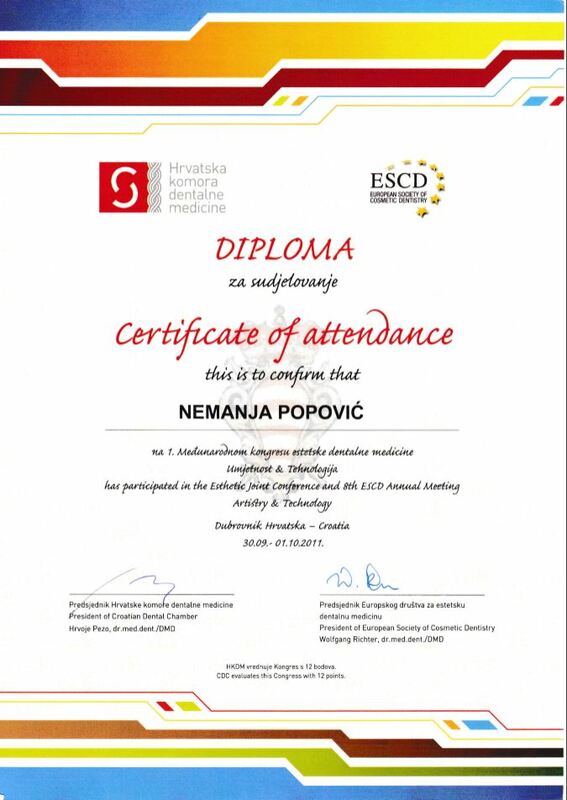 She is at the specialist studies in the same field since 2010 and passed the specialist exam in 2016. 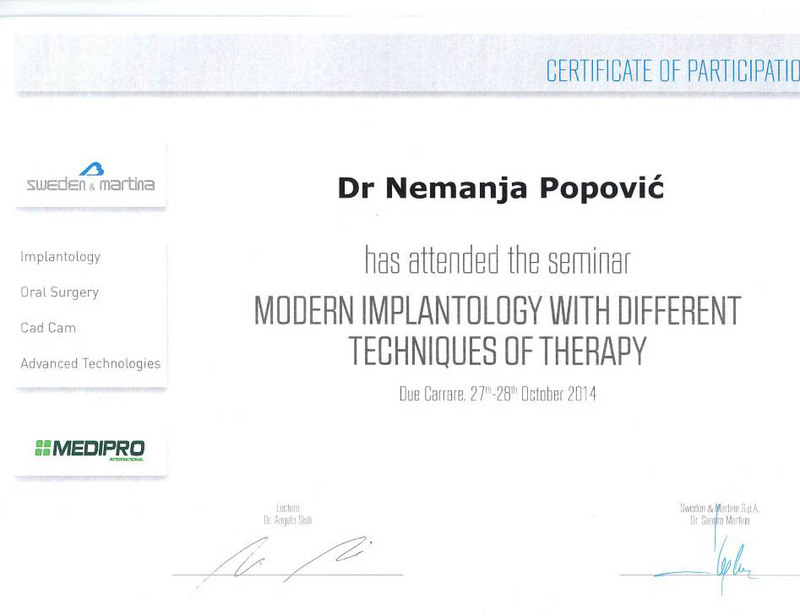 Mirjana is a participant of two scientific projects and an author of numerous scientific research papers. 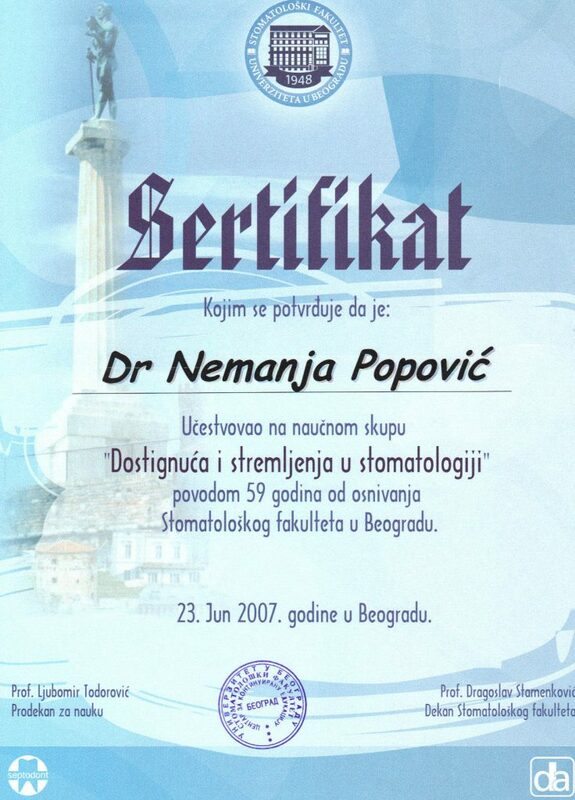 She works as a consultant at ‘’Dr Popović’’ practice since 2010. 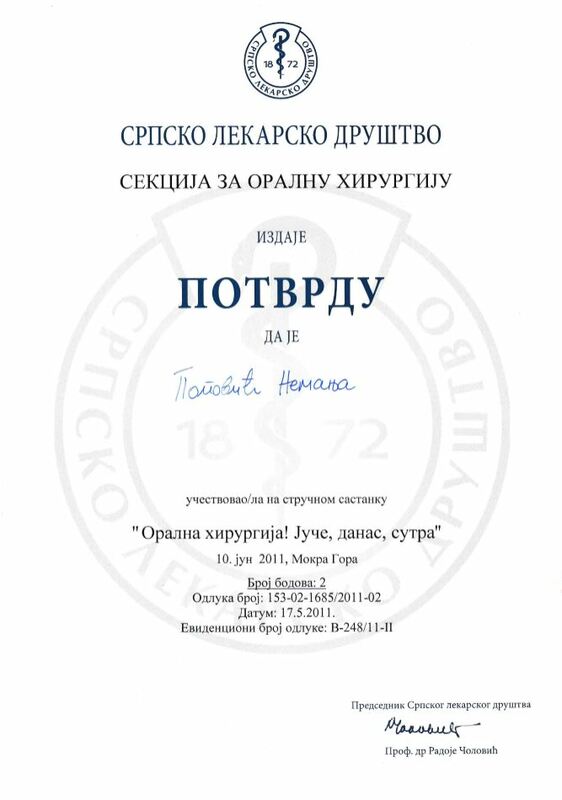 Dr Ivana Stamenic graduated from the Faculty of Dentistry, University of Belgrade in 2013 with an average score of 8.5. she did the one year internship in ‘’Majestik’’ dental clinic and for a period of one year reached the dental clinic, the Majestic and the Faculty of Dentistry in Belgrade. 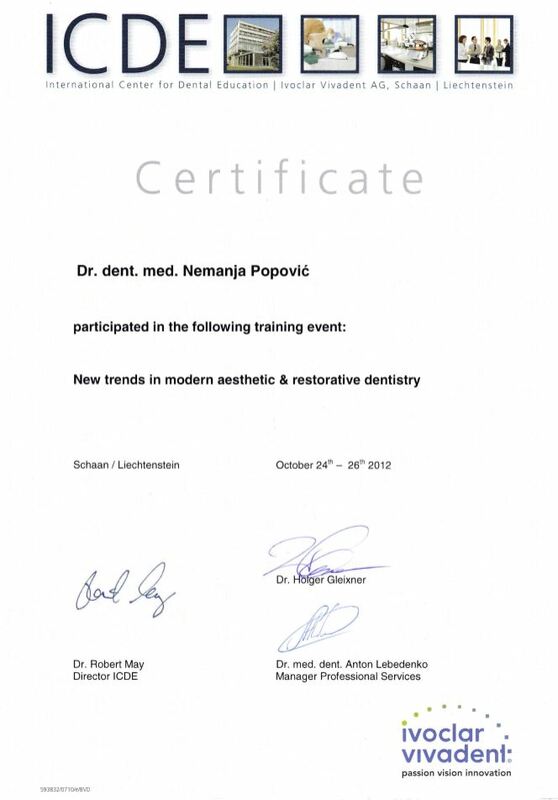 She volunteered in a private dental office ‘’Dental focus’’ from 2011 to 2014. 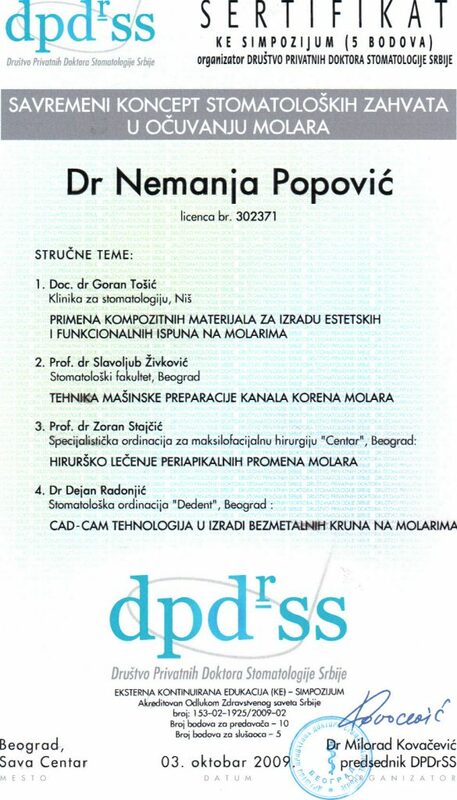 From 2014 to 2016 she attended continuing education at the Department of Prosthodontics, at Faculty of Dentistry in Belgrade. She works for ‘’Dr. 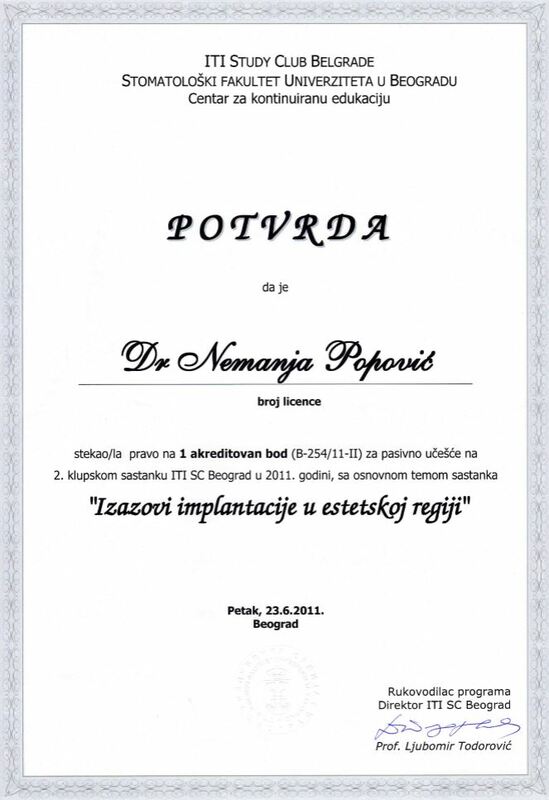 Popovic’’ since February 2016. 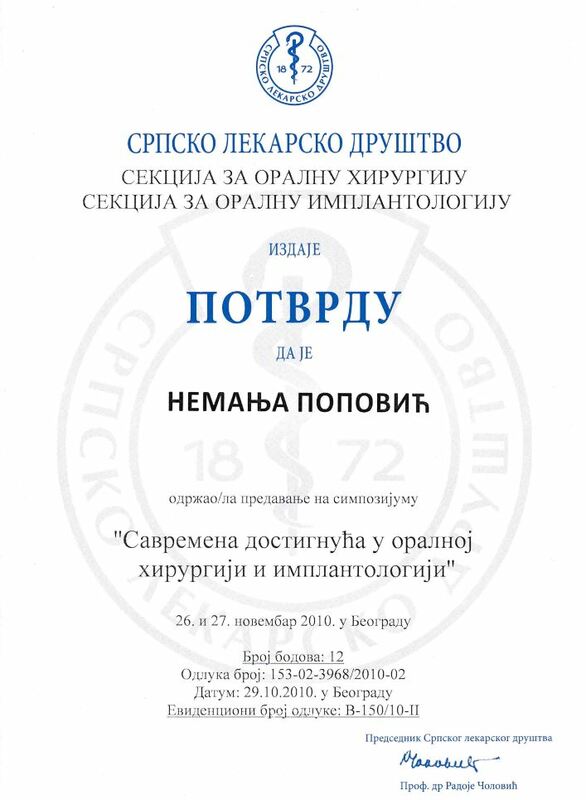 Dr Maja Manojlovic graduated at Faculty of Dentistry, University of Belgrade in 2015, and in 2016 she passed the state exam. 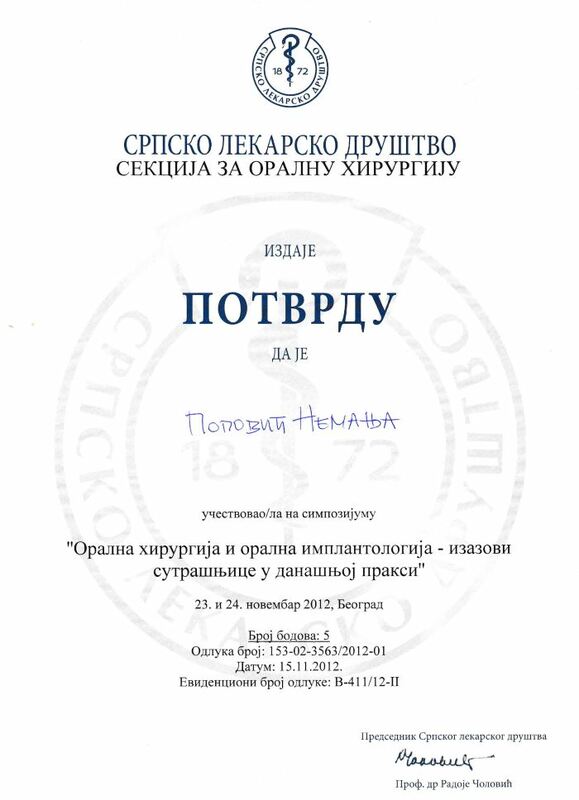 From August 2015 to June 2016, she was an intern at the Faculty of Dentistry at University of Belgrade and Zemun KBC. During 2015 to 2016, she was volunteering, working as an assistant and she did dental photography at the clinic ‘’Orto “. 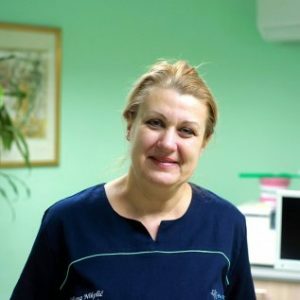 She works for dental practice "Dr Popovic“ since 2016. During dental school, she has participated as an author and co-author of scientific-research works in the field of prosthetics. 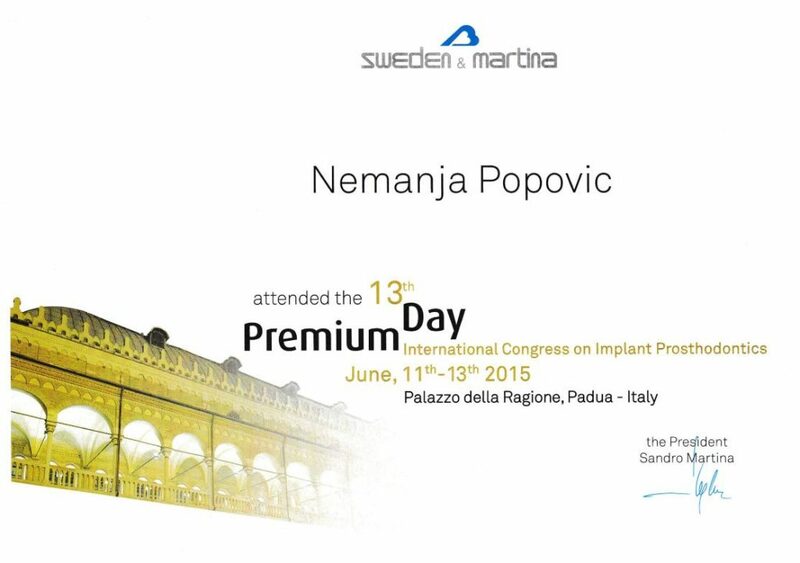 She attended various lectures and courses in the field of prosthodontics, and endodontics. 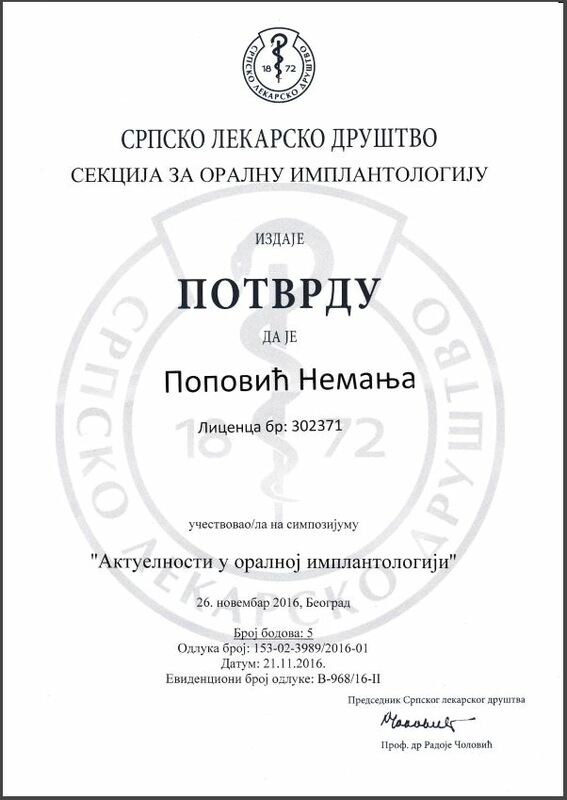 Milica Manasijević finished Dental technician school in Belgrade, majoring as Dental technician in 2015. 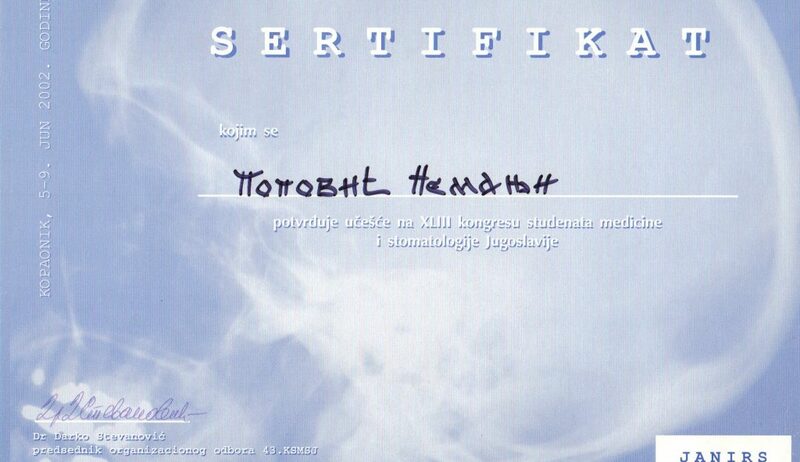 She volunteered as a dental technician in the laboratory of Dental technician school. 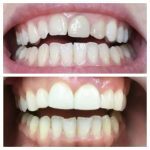 She did the retraining for dental nurse in 2016. 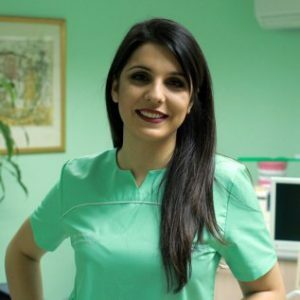 She works as a dental nurse at ‘’Dr Popovic’’ since 2017.